How To Play Super Sic Bo. Stakes from 0.20 – 10k. Evolution Super Sic Bo takes the traditional Asian dice game of Sic Bo to a new Level. The basic premise of the game is the same. You’re betting on the outcome of three dice being rolled. There are all sorts of totals and number combinations to bet on, which make this game an exciting challenge. Evolution Gaming has further super charged the game, by adding in a series of Random multipliers, just like on Lightning Roulette. When betting has closed a range of random multipliers up to 1000x is assigned to different betting positions on the board. What you need to know is only certain betting groups qualify for the multipliers. In addition the multipliers are capped on those positions. I’ve done the analysis and you’ll find below details of all the betting positions that qualify for a multiplier and the range you can expect. I’ve also detailed the playing strategies that are likely to prove helpful when playing Evolutions Super Sic Bo. How is Evolution Super Sic Bo Played? Evolution Super Sic Bo is played in a purpose built studio area at Evolution’s Studios in Riga. 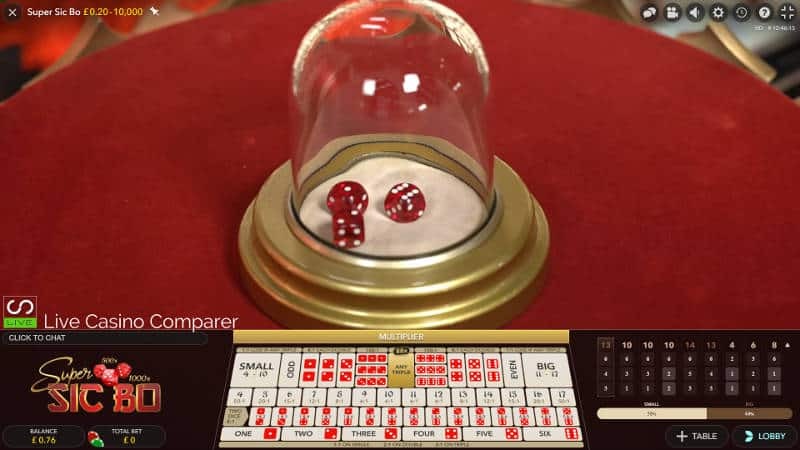 The live dealer or Presenter sits at a small round table on which a Glass domed dice shaker sits. There are 3 six sided dice under the glass dome. 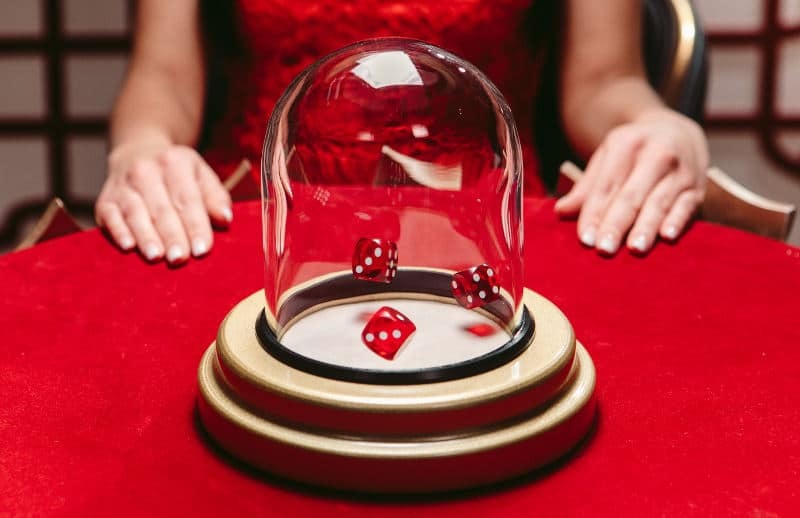 When betting time has expired the Sic Bo dome starts to vibrates causing the dice to skip around as if on a hot tin plate. A few seconds later the vibrating stops and the dice come to a stop. The upper face showing on each dice becomes the result. 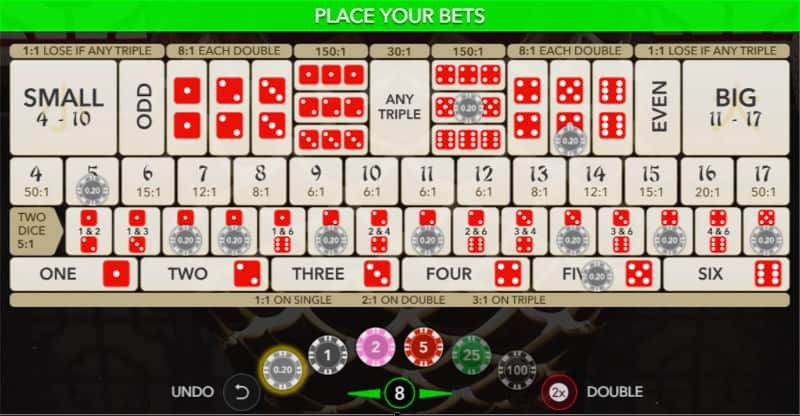 From a betting perspective you place bets on the numbers or combinations of numbers that you think the dice will settle on showing. Betting on Super Sic is the most enjoyable part of the game. There are many bet combinations you can make. From Totals, Odd or Even or specific Triple numbers bets. The more specific the bet, the higher the payout will be. The highest paying bet is a Triple, which pays 150-1. 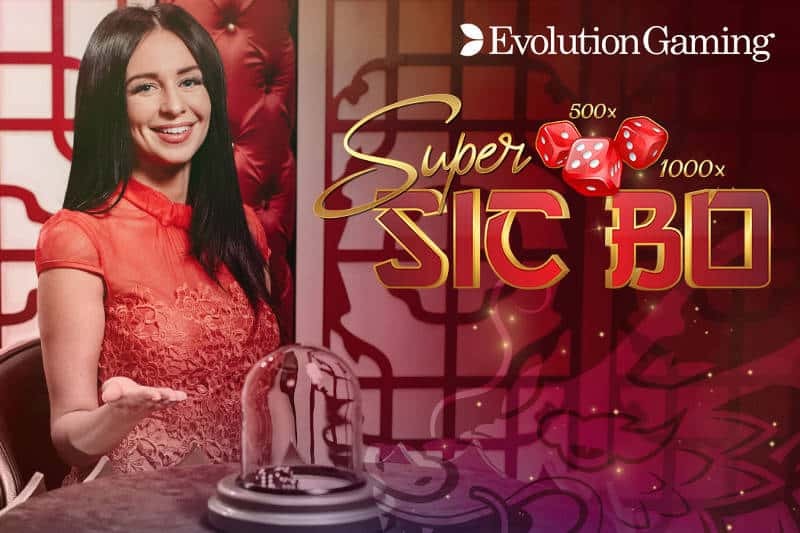 The difference between normal Sic Bo payouts and Evolution Super Sic Bo is the addition of random Multipliers applied to bet payouts of certain bet types. Lets take a look to see what that means in reality. As you’ll see from the table, the enhanced or Random Multipliers are not applied to the EVEN Money bets on the table. To stand a chance of your bet being multiplied you have to be playing on one of the other bets. Also note that the multipliers are capped for certain bet types. Whilst it appears the Multipliers are completely random, the reality is they’re not, there are some pre-defined rules that determine what multiplier and range is allocated to a bet type. Small / Big A bet on the total of three dice. Worthy of a mention. The multipliers are funded by a reduction in the payout odds on the base game. If you’re more interested in “returns” you’ll get better payouts at a Playtech Casino that has regular Sic Bo. The RTP for the entire game of SIC Bo is 97.22%, which is calculated on the Big/Small, Odd/Even Bets. The range of RTP across all bets is 95.02% to 97.22%. Evolution Super Sic Bo comes with a really nice set of Roadmaps, that show the previous game results. They are divided into two views. This results view shows the last 9 Results. For each result the total number of the 3 dice is shown. Below that value of each dice is displayed. This results view is a more traditional looking Roadmap. It displays the Big/Small and Tie results. These tend to be the most common bet types and most closely align to Dragon/Tiger type betting. When presented with a new game I wonder whether there is an effective and optimal playing strategy. With Evolution Super Sic Bo I’m doubly curious. There’s three things I’m looking for in a strategy. A strategy that will help me enjoy the game more, i.e something capable of helping me turn my bankroll over a lot of times. How to place my bets for I get the best chance for a return. I want to know how to be betting on the numbers that get the multipliers. Lets examine each to see what’s possible. This will suit you if you just want to play for a long time. Firstly, select your bet size as a proportion of your over all bankroll. A single bet size no more than 10% of your total is a good place to start. Secondly, only select bets where you have a 50% chance of winning. In the case of Sic Bo that’s the Big/Small or Odd/Even bets. These pay out at even money 1:1. Thirdly, while not indicative of what the next result will be, review the previous results to see if there are any patterns you can follow, or go against. To get the best returns you need to adopt a more risky strategy. This involves placing bets on the numbers and combinations that have better payouts than 1:1. The downside of this is you’re less likely to win, but when you do you make more back. I like to hedge my bets when playing this strategy. By this I mean I pick a combination bet and also an insurance bet, so if one one doesn’t win the other most likely will. It’s not guaranteed though, when you win you still have a losing bet that will reduce your overall payout. 1st Bet – I place a Big/Small or Odd/Even bet and then a small bet on Any Triple. The even money bets don’t pay out for a Triple, but the Triple pays out 30:1 when it hits. 2nd Bet Type – Place a Two Dice Combo – any ones you fancy, they all pay 5:1. Place a hedge bet on a Number not covered by the Combo. This pays Even money for a single, 2:1 for a double, 3:1 on a Triple. 3rd Bet – Play the large Payout bets, Like Any Triple and named Triple. They don’t come in often though. So bet on some of the Total bets around the 6:1 mark. I use this structured approach, but it’s no guarantee you’re going to win, but you’ll have fun with it. The best bet position for the highest Multiplier up to 999x is the Specific Triple Bet. If your only interested in hitting that, just keep betting on that position for every game ground. The beauty is you don’t need to bet much to win big. I treat the multipliers a side bet in Blackjack. It’s a bit of fun, If it hits you’re in the money. Total Bet – 4 or 17 pays up to 499x. Normal payout is 50:1. Total Bet – 5 or 16 pays up to 249x. Normal payout is 20:1. Specific Triple – Up to 999x. Normal payout is 150:1. Check out my table above for details on the other payout options. The number only sic bo strategy is a simple betting strategy that uses One number to determine where to place your bets. For Example. If your favourite number is 5, you place a bet on every cell that contains an element of the number 5. Total Bets – 5 or 16, 6 or 15. Combinations – 1&4, 1&5, 2 & 3, 2&5, 3&5, 4&5, 5 &6. You don’t have to use 5 but you get the idea. You’re also more likely to hit Multipliers with this bet. All device types can be used to play Live Super Sic Bo. Personally I think the game is best played on a Desktop or Laptop/Tablet as they give the biggest betting Grid. Landscape on Mobile is fine, especially if you have smaller fingers. If you have fat fingers like me, you’re likely to hit two betting segments at the same time, so be prepared to reverse your bets often. I’m not going to lie, Evolution Super Sic Bo is not a game that I’d thought I’d enjoy playing. Bizarrely it’s not the Multipliers that hooked me, it’s getting an understanding of and executing a betting strategy that keeps you interested in the game. I can quite see how addictive it can be, as much as Live Roulette or the new Dream Catcher Monopoly game. I think the Presenter has an important role in any live game. On first look I’ve been disappointed that they seem bored and have trouble stifling their yawns. Not a good image. That aside, I like the presentation of the game, although the shaker noise is a bit loud for me and drowns out the soft voices of the dealers.